While many see disruption as a bad thing, Kuba Jewgieniew believed it was exactly what the real estate industry needed when he founded Realty ONE Group in 2005. 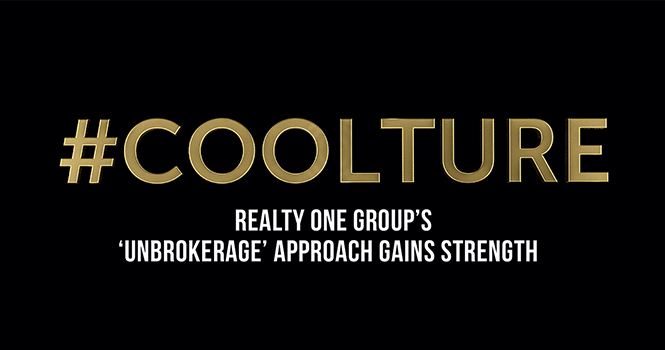 But it wasn’t just Realty ONE Group’s commission structure that fueled its growth over the past 12 years—the firm’s expansion was also the result of something far less tangible, something Realty ONE Group refers to as “coolture.” A playful combination of “cool” and “culture,” the term embodies the company’s high-energy, people-focused, can-do environment, punctuated throughout with a healthy dose of fun. Realty ONE Group’s people-centric, high-growth business model is exactly what has attracted not only top real estate professionals, but top-level executives, as well. The firm’s agent-first focus was exactly what attracted industry veteran Burke Smith. As a licensed California broker, a real estate coach, and former executive at Prudential California Realty and HSA Home Warranty, Smith knew that Realty ONE Group offered something completely different—something the industry needed. While disruption usually gets a bad rap, at Realty ONE Group, it’s a testament to the firm’s success. Alex Mihai is Realty ONE Group’s general counsel, practicing law in California since 2006. He joined the firm two years ago for three reasons: its agent-first culture; the fact that its branch managers are onsite and non-competing; and the support Realty ONE Group provides for its agents. According to Jewgieniew, Realty ONE Group’s future-focused approach to the real estate business is necessary for succeeding path forward—it’s a case of change or get left behind. A big part of adapting to meet the changing needs of agents and their consumers involves technology. And Realty ONE Group believes it is ahead of the curve on that front. Realty ONE Group holds nothing back when it comes to providing the tools, training and technology agents need to be successful. In fact, during its recent ONE Summit, the company introduced ONE University, an in-house educational program designed specifically for its real estate professionals. The extent of Realty ONE Group’s dedication to training was especially impressive to Smith, who has coached and trained thousands of real estate agents over the course of his career. Realty ONE Group agents also benefit from a mentorship program carried out by the firm’s non-competing branch managers. The firm’s goal is to do whatever it takes to foster agent success and support their journey toward becoming true business owners. Realty ONE Group’s commitment to hiring the best agents and supporting their success in every aspect has one ultimate benefactor: the consumer. Continuing to grow the company while ensuring success for agents and the best possible experience for consumers means that Realty ONE Group must also remain open to change. And that’s no problem, since change is built right into Realty ONE Group’s DNA. Privately held and 100-percent debt-free since day one, the company has the freedom to pivot and respond as the market demands. Ultimately, it’s a combination of factors that allows Realty ONE Group to stand apart, paving the way for future growth.